HONG KONG, July 31, 2018 /PRNewswire/ -- Turing today introduced HubblePhone™, a futuristic device with an advanced vision system and the perfect blending of four products - a revolutionary multi-screen smartphone, a 5G communication device, a professional grade camera with advanced image and HD video editing software, and a mobile gaming console - in a never-seen-before versatile handheld device. HubblePhone ushers in a new era of mobile computation to address the rise of artificial intelligence (A.I. ), letting users control HubblePhone with their voice or via lip reading, which entirely reinvents how a smartphone will be utilized. "The most natural way to control a device is with our voice. In noisy environment HubblePhone utilizes lip reading technology, revolutionizing how we interact with mobile devices," said Syl Chao, CEO of Turing Space Industries. Turing has partnered with a number of leading smartphone manufacturers to develop, produce and deliver the HubblePhone from Turing. HubblePhone's multi-dimensional screen and camera system allows users to make calls by simply saying a name or number with voice or by silently moving their lips. HubblePhone auto-syncs all of your vital information, including photos, contacts and emails from your current smartphone, PC, Mac or Cloud services via H-Sync™. In addition, Hubble M.I. automatically manages your most frequently used apps, calls, messages and securely stores vital information on the device's secure storage. HubblePhone includes an Artificial Reality (AfR) messaging application which allows users to send 3D animated messages projected into the recipient's immediate physical surroundings. AfR Messenger allows 3D scanning of real world objects while Hubble M.I. transforms them into visually compelling, communication friendly 3D AfR stickers. HubblePhone features up to 50 percent faster data speed, compared to existing 4G networks thanks to 3GPP's 5G NR standard. 5G NR allows HubblePhone users to download or stream 4K video content in a matter of seconds. Hubble Show™ is the world's first mobile entertainment hub, which will host television shows and music videos that utilizes the HubblePhone's Multi-screen API and 5G NR speed to deliver multi-dimensional entertainment programs displayed on one or more HubblePhone screens. 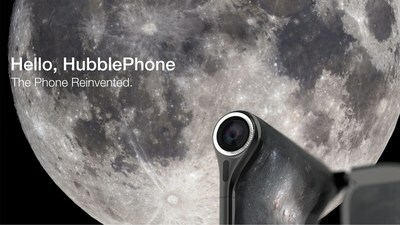 HubblePhone features a micro-space-telescope camera with 15X optical zoom and a video editing software application that dwarfs any available on today's smartphones. In addition, HubblePhone also hosts additional cameras across different screen surfaces to suit all types of mobile photography from professional quality portraits, action packed scenes to simple selfies. HubblePhone utilizes an emotional machine-intelligence chip to provide a next-gen mobile gaming experience. The added computation, multi-screens, and advanced camera features create a new dimension in mobile gaming by integrating AR, VR, MR, XR and AfR technologies into a cohesive experience. HubblePhone is targeting a Q1 2020 official worldwide release. It will be priced at $2,749 with availability in the US by June 2020, Europe by August 2020, China by September 2020, and the rest of the world by December 2020. 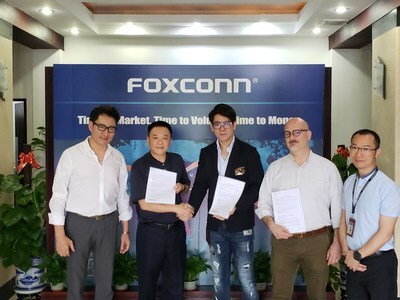 HubblePhone includes support for 5G NR, 4G LTE, 3G and GSM bands, powered by two of the SDM855 SoC and one SDX50 5G modem.